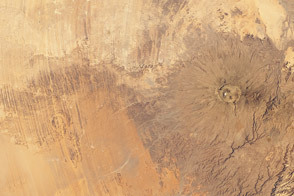 Aorounga Impact Crater is located in the Sahara Desert, in north-central Chad, and is one of the best-preserved impact structures in the world. The crater is thought to be middle or upper Devonian to lower Mississippian (approximately 345–370 million years old) based on the age of the sedimentary rocks deformed by the impact. Spaceborne Imaging Radar (SIR) data collected in 1994 suggests that Aorounga is one of a set of three craters formed by the same impact event. The other two suggested impact structures are buried by sand deposits. Astronaut photograph ISS020-E-26195 was acquired on July 25, 2009, with a Nikon D3 digital camera fitted with an 800 mm lens, and is provided by the ISS Crew Earth Observations experiment and Image Science & Analysis Laboratory, Johnson Space Center. The image was taken by the Expedition 20 crew. The image in this article has been cropped and enhanced to improve contrast. Lens artifacts have been removed. The International Space Station Program supports the laboratory to help astronauts take pictures of Earth that will be of the greatest value to scientists and the public, and to make those images freely available on the Internet. Additional images taken by astronauts and cosmonauts can be viewed at the NASA/JSC Gateway to Astronaut Photography of Earth. Caption by William L. Stefanov, NASA-JSC. 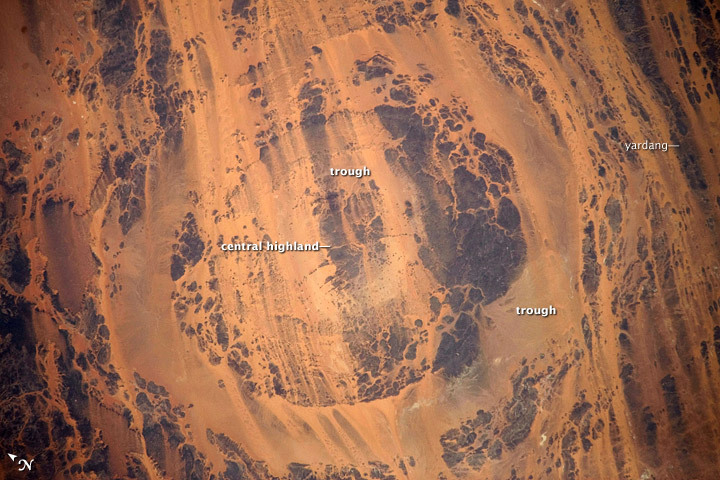 Taken July 25, 2009, this astronaut photograph shows the concentric rings of Aorounga Impact Crater in north-central Chad.